Gold Shop is a serious groover - funky as all get out, but still hitting that pop song bullseye. 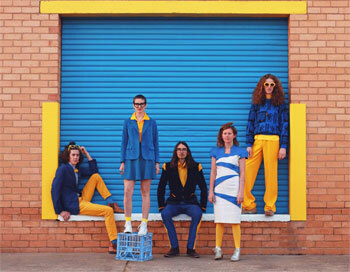 Energetic folksters Perch Creek are back with a mischievous new single Gold Shop, a thrilling car-chase of a track, out March 23. The family band has also announced a hilarious, vintage-inspired clip to accompany Gold Shop, directed alongside Honey Editorial. This single is the second taste of Perch Creek's new self-titled album, which is an eclectic and innovative collection of harmony-driven folk, evocative pop and offbeat soul, set for release on April 13. To celebrate the album, the group will be heading out on an epic national tour, kicking off on May 31 at Fly By Night in Fremantle, WA, then swinging through regional and metropolitan cities in NSW, ACT, QLD, SA and VIC. 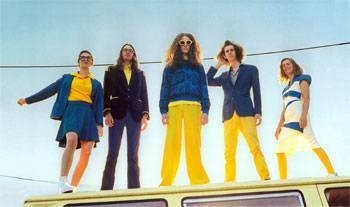 Gold Shop is a serious groover - funky as all get out, but still hitting that pop song bullseye. It's not only the irresistible music, but also that enjoyably perplexing storyline that makes you want to watch it over and over again. Perch Creek's bassist and token non-sibling, James Chandler, explains, "It's about [lead singer] Eileen's moustachioed male alter ego bemoaning the woes caused by his own alter ego (a shady female) who is committing crimes and getting him/her into big trouble. Are we confused yet? It was inspired by the multitude of gold ''souks'' in the world's capital of bling, Dubai, where we spent a week performing at a shopping festival. It wasn't exactly Golden Plains but we managed to have a great time nevertheless." The clip for Gold Shop is an out-and-out winner – imaginative, fun, and channeling the best bits of those brilliantly corny 70's action flicks. The audience are kept on the edge of their seats, following the escapades of the group as Eileen tries her best to avoid the cops who are chasing her for a crime she didn't commit. There's dancing, bands in vans, bikini girls, court trials and clever chase scenes – all coming in at under five minutes! Reflecting on the clip, James says, "We came up with the general concept of a 70's style action chase (inspired by the classic Beastie Boys film clip for Sabotage) featuring our Kingswood, maybe a fake moustache and the backdrop of the North Coburg industrial zone [in Melbourne's north]. It wasn't until we met Sasha, who directed and shot the film with Honey Editorial, that the screenplay really took shape. They capitalised on our comic acting and made full use of our vintage car and bike collection to create an epic, hilarious and at times confounding 4 and a half minute action flick. It's definitely the coolest video we've done yet." Gold Shop is almost an anomaly on this diverse new album from Perch Creek. Recorded and produced by J. Walker (Paul Kelly, Jen Cloher, Machine Translations) and mixed in collaboration with Andy Stewart (Gotye), stunning arrangements and glorious harmonies abound, soaring particularly high across the divine album-closer Belle. Opening track Why Won't You Come Home features brooding rock organ over lamenting vocals in the verses, breaking into a head bopping major-key chorus. The song is driven by pulsing bass lines that continue to groove their way through Mama Sings and the rest of the album. While vocal duties are shared amongst the group, and stylistic elements vary from track to track, there's still a definite sense of cohesion throughout this intriguing release – these are clearly very skilled musicians, and their shared musical childhoods is evident in the way they can turn any genre into their own sound. In keeping with the creative process honed on previous albums, all the music and lyrics on this release were written in a five way collaboration beween band members. This album has been a long time coming and marks a distinct change in direction for the band, as James explains: "After our last album we felt that our folk/roots/jugband phase had come to a natural conclusion so when it came to writing this album we just jammed and let the music come naturally. Lyrically there are some themes of disillusionment, a lot of reflectiveness plus a random song about a gold heist..." "(Finally releasing the album) feels like a Baywatch-style slow motion run toward the ocean that has lasted more than three years, but has finally reached the point where we are diving in and beginning to taste the salt water…"
The group is set to play a massive run of shows to celebrate the release of the album – expect to see and hear multiple lead vocalists, lots of sibling vocal harmonies and a lot more electric guitar than old fans may be used to, while still maintaining the band's trademark mix of intensely high energy songs interspersed with atmospheric ballads. Perch Creek is Camilla Hodgkins on keyboard and vocals, Lear Hodgkins on drums and vocals, Eileen Hodgkins on guitar and vocals, Christi Hodgkins on trombone, saw, harmonica and vocals and James Chandler on bass and vocals. Gold Shop is set for release on March 23, and Perch Creek will available through MGM distribution on April 13. Camilla Hodgkins: Rocking harmony folk pop. Question: Where did the idea for the Gold Shop clip, come from? Camilla Hodgkins: We worked with the best cinematographer, Sasha Kane of Honey. We were inspired by The Beastie Boys' clip for Sabotage and the fast-edit, quirky and colourful film style of Sasha's work. We wanted to make a fast-paced action clip based around the lyrics of the song – inspired by the classic and over-the-top gold souks in Dubai. Sasha fleshed out all of our ideas into a fully formed story. Question: Why did you decide to do a rural tour with dates in Sandy Point, Kyneton etc? Camilla Hodgkins: We almost always include regional venues on our tours; there are often so many beautiful venues, some of them forgotten about, and lots of them thriving. Country audiences are enthusiastic and welcoming. Camilla Hodgkins: Daffodils - I get to kick it in with a driving keyboard part! I love the trombone in this song, all the harmonies, and how people dance to it. Question: What should we expect from the upcoming tour? Camilla Hodgkins: A heap of new songs, and five band members who are excited to be touring again after two years on the down-low! We'll be selling our album on vinyl, as well as t-shirts and some one-off tour merch. Expect our usual ridiculous sibling banter, Eileen jumping out of her boots, funky dancing songs and a few epic ballads with awesome harmonies. Camilla Hodgkins: Our aunty Carol, she is the best dancer and most colourful dresser, at 70-something she always brings the best vibes. Camilla Hodgkins: I love both. I love the spontaneity of performing live, always trying to develop a connection with the crowd, sometimes it's easy and sometimes hard. Recording is more creative and I like being able to try different ways of playing keyboard parts and song arrangements. I also really enjoy bringing other people into the normal band set-up – this time it was our producer, J Walker. Its fun and refreshing having new ideas and vibes. Camilla Hodgkins: Four of us are siblings and have been playing music together (encouraged by our parents) since we were small. My boyfriend James joined the band soon after we got together. Question: What is the story behind the name, Perch Creek? Camilla Hodgkins: Perch Creek is the name of the creek that runs around the property most of us grew up on in Northern NSW. We used to be called the Perch Creek Family Jugband back when we were actually a jugband, but stripped back to Perch Creek a few years ago, our music is much broader now. Camilla Hodgkins: We like to write collaboratively, and usually set aside a block of time where we can focus on just songwriting. We started writing our current album in the hills of Wales during a tour of Europe and the UK in 2014. I think being in a different and focused place, combined with the energy of the other band members is the motivating drive behind most of our writing. Camilla Hodgkins: We were (and still are) excited by the great scene of festivals in Australia, they are often our favourite gigs. We were also inspired by other artists that we saw touring like Jordie Lane and Flap! Camilla Hodgkins: Paul Kelly – I think he collaborates so well with different artists, always exploring different styles and sharing vocals. Harmonies sound awesome behind PK's voice.